Helsinki- and Shanghai-based firm PES-Architects have completed their seventh project in China: the Fuzhou Strait Culture and Art Centre. Helsinki- and Shanghai-based firm PES-Architects have completed their seventh project in China: the Fuzhou Strait Culture and Art Centre. A stunning fusion of the Finnish awareness of spatial perception and the local culture through an architectural interpretation of the floral emblem of Fuzhou: jasmine. Fuzhou is the capital of the Chinese province of Fujian and is an important port on the southeast coast of China. It has access to the Pacific Ocean through the Taiwan Strait. Fuzhou is also home to leading universities and key authorities of Fujian as well as being one of the fastest-growing metropolitan areas in the world. In 2013, the Fuzhou city government called an international invitational competition for the Fuzhou Strait Culture and Art Centre. The idea was to build up the city's cultural image, particularly in the Mawei district, which is the object of a major development plan. The competition winners were the team from PES-Architects, a firm founded in 1968 in Finland by Pekka Salminen. Since 2010, it has been based in Shanghai as well as Helsinki. In China, the architecture firm completed the Wuxi Grand Theatre in 2012 and the Icon Yunduan Tower in Chengdu in 2017. The winning proposal of PES-Architects for this new multipurpose hub is inspired by jasmine, the floral emblem of Fuzhou. A reference that is reflected in both the formal language and the colour of the architecture. The main concourse lobby is an open space to be used for cultural activities. Here, massive Mushroom Columns house ventilation equipment and elevators connecting the ground level with the terrace, and Sky Blossom skylights in the roof allow daylight to filter through. The roof terrace is accessible via two ramps from the Jasmine Gardens as well as from the Central Jasmine Plaza, providing a seamless connection from the complex to the Minjiang Riverfront level. On the underground level, another pedestrian ramp is located along the Liangcuo River to connect the landscape to the interiors, as well as providing a link between the metro station and the Fuzhou Strait Culture and Art Centre. 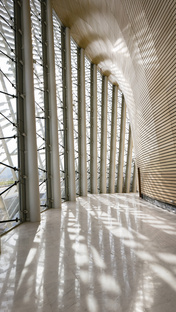 PES-Architects put a lot of effort into the choice of materials focusing on a very close connection with local tradition, including ceramic in reference to the legendary Bone China, and CNC machined bamboo cladding for the auditorium. The Fuzhou Strait Culture and Art Centre by PES-Architects perfectly brings together the Finnish awareness of spatial perception and the tradition and history of Fuzhou for impressively sweeping harmonious, elegant architecture that connects with the urban context.